Don’t let a machine get in the way of you and homemade ice cream. Get to scooping with these 50 easy no churn ice cream recipes! There is no churning or special equipment required for creamy, firm, Amaretto Ice Cream. It is ready to freeze in minutes and only requires 4 ingredients. This no churn cookies and cream ice cream is so creamy and simple, you won’t need to use an ice cream maker ever again. And it’s just 3 ingredients! The smoothest ice cream made without an ice cream maker and only 4 ingredients! Coffee flavored ice cream speckled with mini chocolate chips is great for a summer afternoon pick me up. You will not believe how simple this delightful coffee crunch ice cream is! No churn ice cream is super easy to make. Especially since you don’t need an ice cream maker to make it! If you love mint chocolate chip ice cream like I do, you’re going to love this recipe. Easy No-Churn Blueberry Ice Cream … only 5 ingredients are needed for a delicious and simple treat to enjoy this summer. You don’t need an ice cream maker to get the amazing texture of homemade ice cream! Scoop and serve with additional Snickers bites, caramel sauce, chocolate sauce, peanuts – and possibly a cherry on top! Caramelized Peaches with Brown Sugar & Cinnamon No-Churn Ice Cream has all the richness and fruity flavor you could ever want in your ice cream! I LOVE ice cream and homemade ice cream is even better, but it is a lot of work. THAT is until I used this recipe, it is SO EASY and taste amazing. There is no need to turn or machine the ice cream to make it set up. You just mix it per the direction below pour into a container let and freeze then enjoy! Hope you enjoy this recipe as much as we do! This fresh, sweet, creamy pineapple ice cream is an easy-to-make, healthy treat! There’s no temperamental custard base to make and chill, no ice cream machine to fiddle with, and no pulling the ice cream out of the freezer every 30 minutes to beat out the crystals. You start by making the 3-ingredient crust (easy! ), then you beat the ice cream ingredients together, layer the mixture with the crust in a loaf pan, and pop it in the freezer. The next day you have a creamy, dreamy key lime treat that tastes far better than anything you could buy at the store. Brownie Batter Coffee Ice Cream: swirls of brownie batter in a chocolate chip coffee ice cream makes a fun and delicious dessert to enjoy any time of year. Ice cream that tastes JUST like a pumpkin pie, and takes no work. A healthy diary free alternative made with cashews! Strawberry Rose Ice Cream — a creamy no-churn, no-ice-cream-maker-needed ice cream made with fresh strawberries and just a hint of rosewater. Do you like the green tea ice cream that you get at the Japanese restaurant after getting your sushi fix? Now you can replicate this unique ice cream at home! Best of all, you don’t need an ice cream machine or any other special equipment – this green tea ice cream recipe is created for a home cook! 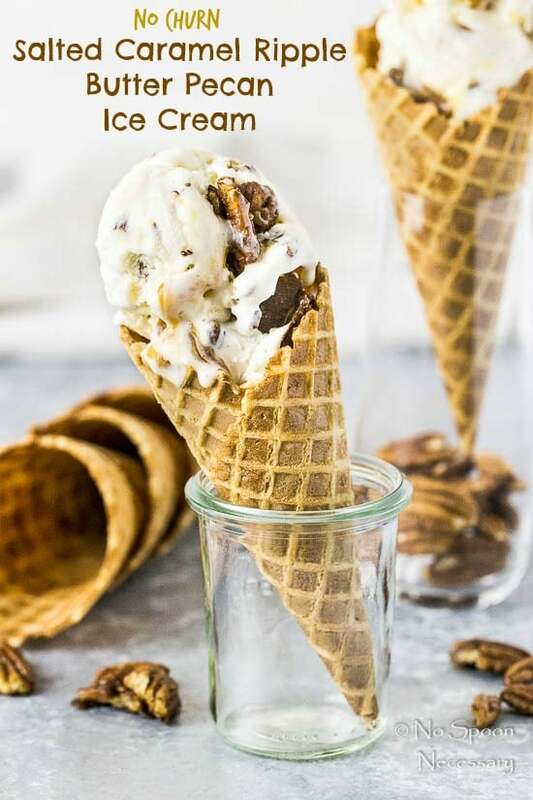 Creamy, silky and smooth ice cream with ripples of rich, salted caramel and clusters of sweet, salty, crunchy buttered pecans. No ice cream machine needed to make this No Churn Salted Caramel Ripple Butter Pecan Ice Cream recipe! This creamy no-churn White Chocolate Raspberry Ice Cream recipe is a dessert you will love to make all year long! This simple no machine ice cream takes white chocolate to a whole new level of dessert! Easy No-Churn Egg Nog Ice Cream: This irresistible holiday dessert has just 6 ingredients, takes 15 minutes to prep, and is made using simple kitchen tools – no ice cream machine needed! No Churn Dulce de Leche Ice Cream is a discovery of epic proportions…not only is it no churn, meaning you don’t need an ice cream machine to make it, but it takes just 2 ingredients, and it stays perfectly creamy and scoopable even overnight in the freezer. You’re definitely going to scream for this one. No Churn – Hazelnut Coffee Mascarpone Ice Cream – Creamy Ice Cream made with no Ice Cream Machine. One of the easiest Ice Cream you can make. Just mix all the ingredients, dump in a container and freeze. And Voila !!! You will be treating your self with creamy Ice-Cream bursting with coffer flavour. Amazingly delicious homemade creamy coconut ice cream, with just three simple ingredients and no machine needed! Considering this ice cream doesn’t require a machine, only has 4 ingredients, and is also loaded with Twix candy bars, it’s pretty much one of the best desserts ever. This Homemade Rocky Road Ice Cream Recipe is bursting with marshmallows, roasted almonds and chocolate chips enveloped in rich chocolate ice cream swirled with chocolate sauce. Hello Lover! If you love Snickerdoodles, but the weather is screaming for ice cream rather than cookies, have no fear. Snickerdoodle Ice Cream tastes like your favorite snickerdoodle cookies, but it’s cool and creamy in ice cream form. A creamy and delicious green treat to celebrate St.Patrick’s day, or any day really. A CREAMY, NO-CHURN ICE CREAM THAT WILL BECOME A NEW SUMMERTIME FAVE! Caramel toffee chip cheesecake ice cream is an easy no-churn ice cream recipe! Swirled with luscious caramel and bits of toffee and chocolate chips, it only takes seven ingredients to make your dreams come true with this easy ice cream recipe. No Churn Orange Dreamsicle Ice Cream – Easy, simple, but utterly delicious- this rich & creamy treat is ready to be whipped up whenever a bit of nostalgia hits.